NO ONE’S BOARD AT THE LUMBER PARTY. On the set of The Lumber Barron, a local movie from Scene & Hurd Productions. 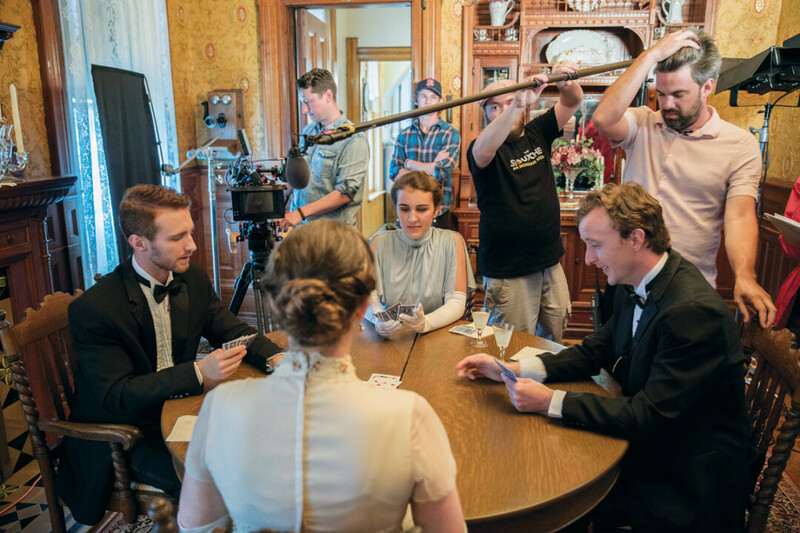 The Lumber Baron, a locally written, locally produced movie about the Chippewa Valley’s fabled timber era, has almost completed filming and will debut shortly after the new year. 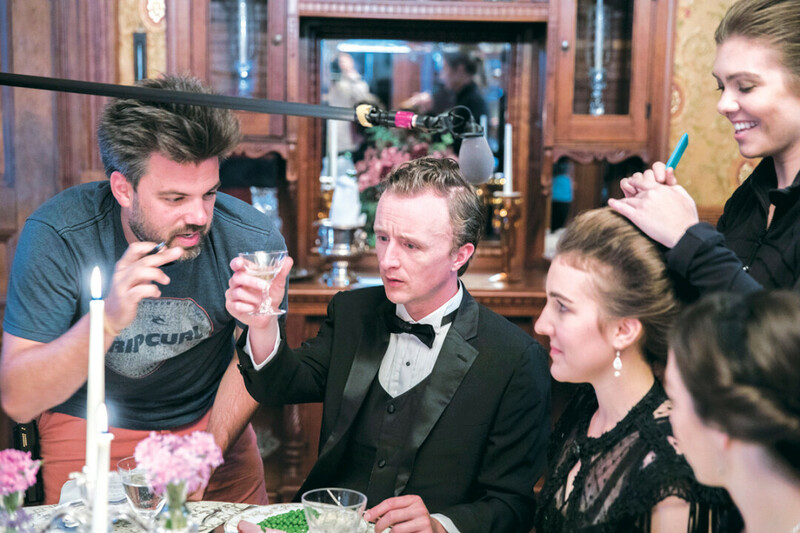 The film was written by Karen Hurd of Scene & Hurd Productions, and it tells the tale of a lumber baron’s family working to keep their business going after their patriarch’s passing. The film stars professional actors as the leads and local actors in smaller roles, and prominently features many well-known (and not so well-known) local historical sites. The Cook-Rutledge Mansion in Chippewa Falls, which features prominently in the film, was the residence of a real-life lumber baron, Edward Rutledge, from 1887 to 1911. 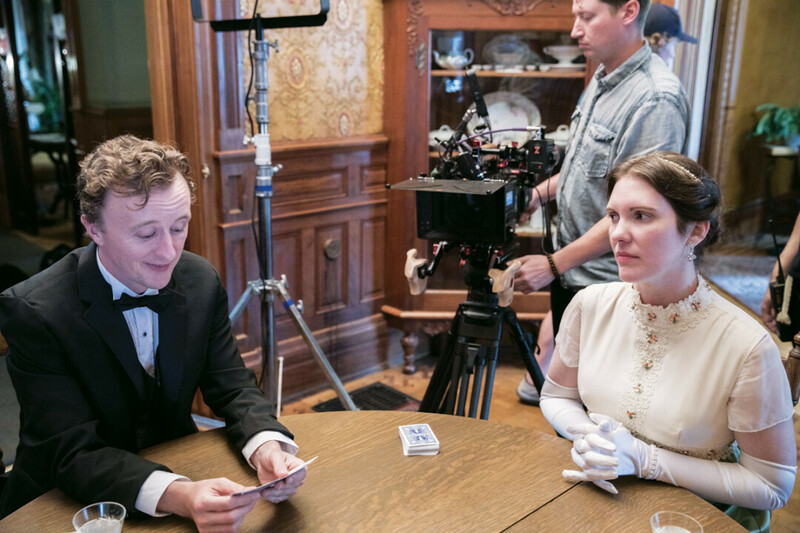 Hurd said using local historic sites in the film brought history to life for her, and local audiences will no doubt recognize some of the settings. “Shooting around the area was great,” she said. “The history of our valley comes alive when we realize that we are walking where the lumber business events occurred.” In addition to the Cook-Rutledge Mansion, footage was shot at the Paul Bunyan Logging Camp Museum in Eau Claire, the Schlegelmilch House in Eau Claire, the Chippewa Falls post office, The Heyde Center in Chippewa Falls, An Amish sawmill in New Auburn, Hoffman Hills in Menomonie, and two privately owned mansions, one in Eau Claire near UW-Eau Claire and the other in Chippewa Falls. Paul Cram – a Midwest-based actor who was recently featured in Fox Searchlight’s Wilson with Woody Harrelson and Peacock with Cillian Murphy and Ellen Paige – reports he played a small but memorable role in the film. He was struck by the locations as well as the congeniality of the others working on the film, and he feels the film will be very well-received by audiences. Hurd said the film is getting closer to completion, and she anticipates it will be ready for distribution (and viewing) by January. “We will finish filming as soon as we have snow on the ground,” she said. “We have about seven more days of filming to do once we have a blanket of snow.” Depending on the weather, she hopes this occurs by the end of November or the beginning of December. As soon as a rough cut is finished, music will be composed by Ethan Wickman, a former professor of composition at UW-Eau Claire who now holds a similar position at the University of Texas at San Antonio. John Stewart, UWEC’s director of concert bands, will serve as conductor. There is no doubt many locals are eagerly awaiting a chance to see the film, and after production wraps and the film is distributed there will be news on how to do so. For updates on this exciting Chippewa Valley project and/or to learn more about the film, check out thelumberbaronmovie.com.